Of course, it is out of warranty. The question is, is it repairable at a reasonable cost? Motorola's support site won't give an estimated cost of repair. "Send it to us and we'll give you a quote" they say. I'd really like a ballpark figure for what it is going to cost before doing that. I guess I'll just have to spring for a new phone. 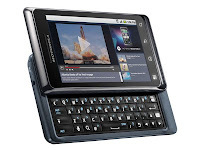 But there weren't many alternatives with a real hardware keyboard and I expect there are even fewer now. I wish I could type using the software keyboard (which I'll have to for now) but I have a 50% error rate. I don't think my fingers are much fatter than normal. How do you guys manage? Perhaps you don't text much and don't do email on the phone.